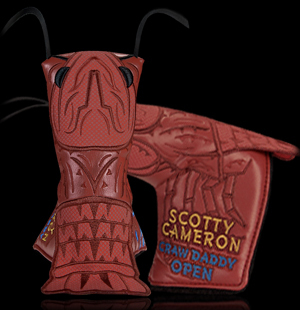 Whether you net ‘em, boil ‘em or add ‘em to your étouffée, Scotty’s Crawdaddy Open headcover will get your mouth watering for some tasty Cajun-seasoned crustaceans. In one of his most elaborate designs to date, Scotty created an embroidered crayfish tail, leather antennae and 3D puff eyes, not to mention a 7 Point Blue Crab Crown. Released to Club Cameron members on March 20, 2018. In a fitting tribute to the major played in the U.K., our Scotty Dog was adorned in the colors and pattern of the Union Jack flag. Made in a limited run of 1,005 with 5 of those in white leather, this red leather headcover was available only in the Studio Store on ScottyCameron.com on July 12, 2011. Scotty celebrated the 2007 U.S. Golf Championship at Oakmont with a special dancing Stars & Stripes Scotty Dog headcover using one of Americas favorite materials - blue jean denim. As American as apple pie, blue jeans are viewed as something the U.S.A. truly made famous. It even has the white fur lining reminiscent of your old jean jacket. And in keeping with a new Scotty tradition, there were 100 special headcovers mixed in at random. Expertly crafted from genuine leather and embroidered with impeccable attention to detail, Scottys 2010 Augusta, Georgia headcover delighted putting purists who value high-end leather and classic Scotty imagery. Our dancing crowned character inspires happy thoughts for success on the putting surface, reminding us all that pure putting begins with a happy face. 2,010 were released to Club Cameron Members in the Studio Store on ScottyCameron.com on April 7, 2010. 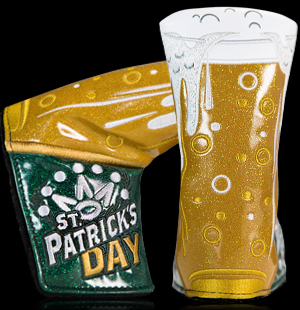 Celebrating the season with a sly smile and a lucky leprechaun's hat, Scotty's Grinder is dancing an Irish jig on this year's St. Patrick's Day headcover. 1,000 treasured pieces were released to Club Cameron Members on March 13, 2013 in the Studio Store on ScottyCameron.com. Happy St. Patrick's Day! Baby, you can drive my car! A lifelong fan of red racecars and vintage speedsters, Scotty was inspired by the location of the seasons final major in the Detroit suburbs when he created the 2008 Motor City Championship headcover. Sporting the number 62, our free-flowing Red Racer revs it up for one of the years most anticipated headcovers. 2,008 pieces were made and released in August to the Studio Store on ScottyCameron.com. Scotland. The birthplace of golf and the ancestral homeland of Scottys Clan Cameron. Mix in a major and you have a recipe for regal elegance. To celebrate, Scotty designed a majestic headcover as an ode to Scotland and his heritage, featuring dignified dancing SC monograms richly embroidered in shimmering gold cable thread on a basket-weave impression. These were released to Club Cameron Members first in the Studio Store on July 13, 2010. Go green with Scottys Augusta, Georgia headcover. Dancing 7 Point Crowns embroidered on green felt pay homage to the games ultimate event. Limited to 1,000 pieces made, these were released on April 4, 2012 to Club Cameron Members in the Studio Store on ScottyCameron.com. How about a Welsh dragon defending the Flag of Europe? Pen to paper, thread to headcover and voila! Scotty created the 2010 Team Europe headcover. 1,005 were offered to Club Cameron Members on September 29, 2010.